George H. Gilliam is an historian and the producer, writer, and narrator of the five-part series, "The Ground Beneath Our Feet: Virginia's History in the Civil War," produced in cooperation with WCVE-TV (Central Virginia's PBS member station) which was broadcast beginning in February 1999. An attorney in private law practice in Charlottesville for more than 25 years before he returned to graduate school to study history, Gilliam is the author of "Business Entities--A Virginia Law Practice System," (Michie-Bobbs Merrill, 1982) and, with photographer Mark Martin, of "Racin'," the story of NASCAR/Winston Cup stock car racing (Howell Press, 1989). His master's thesis, "Making Virginia Progressive: Courts and Parties, Railroads and Regulators, 1890-1910," was published in the Virginia Magazine of History and Biography, and his article "Reconfiguring Virginia," was the lead article in the 2000 volume of The Smithfield Review. He has contributed numerous biographical sketches to the Virginia Dictionary of Biography. His doctoral dissertation, directed by Professor Edward L. Ayers, closely examines the economic history of Virginia during the 19th century. Before returning to the academy, he was a member of the Board of Directors and Executive Committee of Central Fidelity National Bank, Richmond, Virginia, from 1979 and 1998 (when it merged into Wachovia Bank), was Chairman of the Board of Directors of Southern Title Insurance Corporation from 1978 to 1983, and developed commercial real estate. Long active in public service, he was Chairman of the State Board for Community Colleges (the governing body for Virginia's 23 community colleges), to which he was appointed by Governor Charles S. Robb in 1982 and reappointed by Governor Gerald L. Baliles in 1986. He was a Commissioner of the Education Commission of the States from 1986 to 1994. From 1989 to 1993 he served as Chairman of the Pesticide Control Board, a regulatory board created in 1989 by the Virginia General Assembly. He served on the City Council of the City of Charlottesville, 1972-1976, and was the Democratic candidate for U. S. Congress from Virginia's Seventh Congressional District in 1974. He has served on the Vestry of St. Paul's Memorial Church, as an officer or board member of numerous volunteer organizations, was the first president of Camp Holiday Trails (a camp for medically-handicapped children), and was the first chairman in the state of Virginia of a regional community mental health services board (Region X). 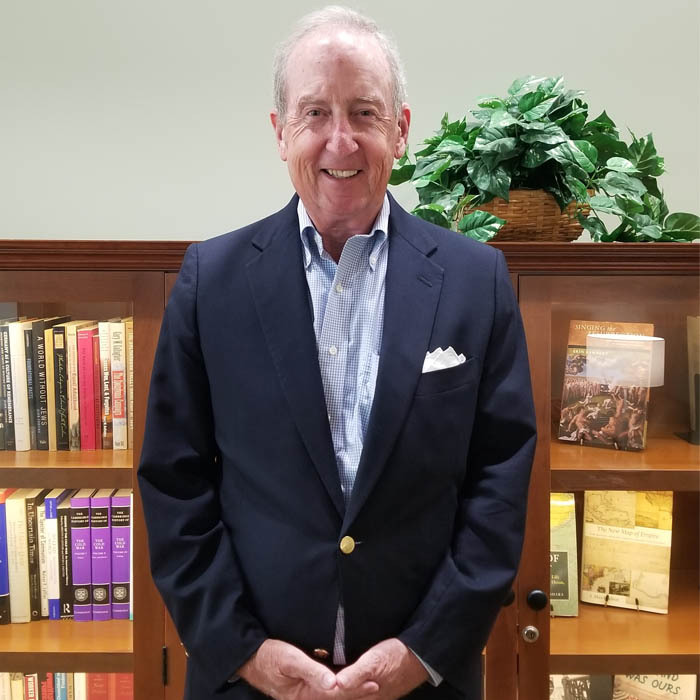 Since returning to the University to study history, he has taught at Piedmont Virginia Community College, Washington and Lee University, and, since 1999, at the University of Virginia. He has taught Virginia Politics and Government, the American History survey, seminars in Southern Progressivism, and, for the past seven years, Virginia history. From 2003-2011 he directed the Miller Center Forum, and hosted approximately four hundred guests for the one-hour public affairs program now carried by more than one hundred PBS member stations around the country, taped before a live audience in Charlottesville. He is married to the former Caroline Page O'Neill ("Page"), a graduate of Wellesley College and the University of Virginia Law School. He is the father of three daughters, Louise, a graduate of Sweet Brier College, now employed by the University of Virginia Department of Space and Real Estate Management; Carter, a graduate of the University of Virginia and the Peabody School of Education, Vanderbilt University, now a public school teacher in California; and Caroline, a graduate of Columbia University and of the Woodrow Wilson School, Princeton University, now an employee of the federal government; and one son, George, a musician and student at Virginia Commonwealth University. He has five grandsons and two granddaughters. Gilliam is a 1988 graduate of the Buck Baker Driving School in Rockingham, N. C., where he studied high-performance driving in Winston Cup-type stock cars. He has driven in events at Summit Point, W. Va., Charlotte, N. C., and Rockingham, N. C. racetracks. He is a licensed pilot and a high-handicap, clearly obsessed, golfer.